Follow us on our archaeological and research adventures with our "On Location" blogs and news. The Newport Tower Meets U-Haul International! The meeting of these two splendid entities actually began in June 2006: when we left IKEA Tempe (after a reconnaissance concerning bookcases), the first thing we saw in the parking lot was a brand-new, 14-foot U-Haul truck ?with a magnificent graphic on its side featuring the Newport Tower! We quickly drove home to pick up our cameras, hoping the truck would still be there when we returned. It was, and the resulting photos can be seen on our Resources page. ?My name is Nicole Shropshire and?I've been designated to research and write the description for the Newport Tower graphic. In doing so, I came across your web site, and I think that much of the information on your site, as well as the pictures of the excavation would perfectly compliment my project? If you have time, I would be very interested in speaking with you about the research that you have done on as well as your findings during your recent excavation. Please let me know if this is something that you would be interested in doing.?? Thus began the connection between the Chronognostic Research Foundation and U-Haul International. We helped with the content of U-Haul?s write-up on the Tower, then began to talk about the formal unveiling U-Haul always does with its new SuperGraphics trucks, designed for states in the U.S. and provinces in Canada. Dates were considered, and it finally emerged that the very day of the Summer Solstice in 2008, Friday, June 20, would work for everyone. Jan went east to participate. The fun began early that Friday morning. 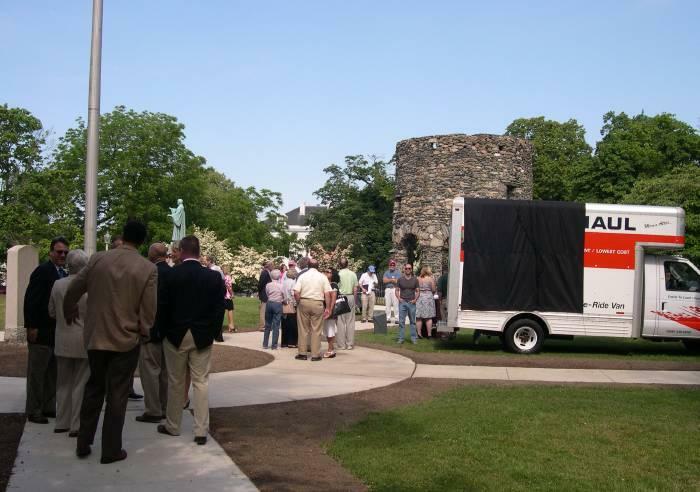 The unveiling was scheduled for 9:30 a.m., and the U-Haul team was there early to bring the truck into Touro Park on the east side of the Tower. The SuperGraphic was covered with a black tarp; tables were set up for Super-Graphic tee-shirts, chairs for attendees, and a lectern for speakers. Suddenly the show was on. Remarks were made, then the tarp was pulled off and the great SuperGraphic of the Tower revealed, Its accompanying copy keeping the puzzle of the Tower in place for attendees (and the people of the states and provinces U-Haul serves) to ponder ? and perhaps to send us more details. All present at the unveiling were privileged to sign the side of the truck; then we toured the Tower itself, Newport Parks Department kindly unlocking the fence gate so that everyone could see the details of the interior walls. It was the loveliest of days in Newport, with blue skies, a light breeze, and the flowering trees of June surrounding us as U-Haul International, Inc. and the assembled crowd paid a special tribute to the Newport Tower and its puzzle, still left for us to solve if we can. For more information on U-Haul?s SuperGraphics program, see www.uhaul.com/supergraphics. Details about the Rhode Island truck are here. U-Haul's own web page about the Rhode Island truck unveiling with photos is here.